Why become a member of Phi Theta Kappa's Chi Upsilon Chapter at MCC? Contact the advisors for an application and if you have any questions. There is a one-time fee of $80 to join. What if I'm not eligible to become a member yet? Should you become eligible in a future semester, you would be invited to full membership. 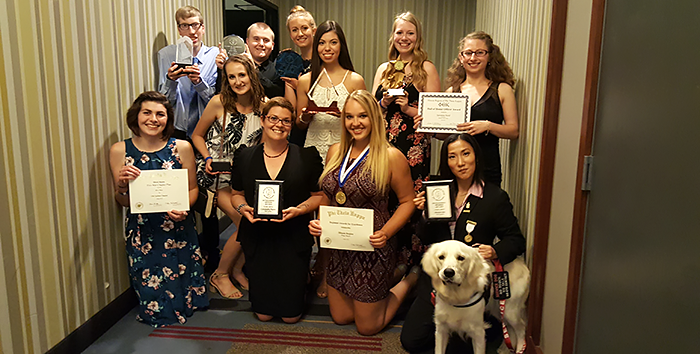 Students from the Chi Upsilon chapter accepted several awards at the June 2018 Illinois Regional Convention. Pictured: Brandon Cipolla, Matt Carter, Madison Schweitzer, Kim Campos, Jessica Swanson, Savanna Held, Lauren Stygar, Sarah Meyer, Katie Yohe, Paige Meyer, and Michie Ota with service dog, Peace. For current students only – use your myMCC login. Books for Africa Packing Party. 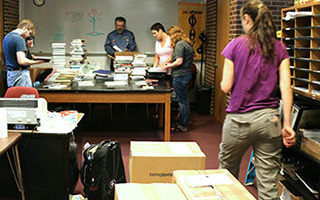 The funds raised from the Books for Africa book drive are used for chapter scholarships. Students participate in an intellectual property fair as part of the 2016 Honors in Action project. For more information, visit us in E118 or call (815) 479-7850.